Last weekend we had to evacuate our house for almost 3 days due to the threat of flooding. This meant packing up all my animals (and couldn’t forget my mom) and heading out to my sister’s house. This is the 3rd time in the last 3 years we’ve had to do this, so I’ve gotten some practice. Luckily, each time we’ve been given about 8 hours before we had to be out. An ever changing number and type of pets makes this a little different each time, but I did pretty good at getting everyone out with everything we needed. Hopefully, you’ll never have to evacuate with your pets, but it’s important to know what to do because no matter where you live there is always a chance something could happen that requires you to leave your house for a few days. Here are some tips that may help if you have to. Prepare. No one ever wants to think something bad will happen, but thinking that nothing ever will doesn’t stop disasters from happening. By be prepared, you can reduce your stress and your pet’s. There are several websites you can check out that help pet owners get ready. ASPCA, FEMA and HSUS have information that can get you started. Make a list. Hearing you have to evacuate starts your heart pumping. Even if you have plenty of notice, it’s stressful trying to remember everything you need to take. I managed to forget 1 playpen that I was going to use for my cats to stay in, so they got stuck in a smaller playpen and the bunny got stuck in her crate (she made me pay for it when we got home; the cats were more forgiving). Making a list ahead of time will insure that everything you will need is packed. Put pets into their carriers before people come to help or before you start putting stuff in the car. My cat Charm is shy around people and I thought about putting her in her carrier before my aunt and sister came to help us. I didn’t and she ended up running her through the house making her more stressed. She finally disappeared and no matter how hard I looked, I couldn’t find her. Since we had everything packed but Charm and the dogs, I sent everyone else out of the house and stayed to look for Charm. Luckily, I found her pretty quickly and even if I didn’t I still had several hours before I needed to be out. Not everyone will have that much time so know your pets and try to get them in their carriers before they start stressing. Take more food than you think you will need. We were allowed to go home earlier than they originally told us which was good because it turned out I didn’t take enough bird food for my parrots. I was lucky and would have been able to go buy some where, but that may not be an option for everyone. By taking a weeks worth of food you’ll have enough to at least last until you can locate some more food. Soft crates are awesome. I use both wire and plastic crates in my home, but for traveling, I love the soft crates. They fold down making them easy to store and carry. If you have a dog who is not crate trained or gets stressed in a crate, they aren’t a good choice because if they get destructive, they could damage it and get out. For those dogs, it’s best to stick to a wire or plastic crate. Expens/Playpens come in handy. These can give your pet some more room to move around especially if you are in tight quarters. You can add a cover to keep anyone from escaping and making it a good option for keeping cats in. Long leashes will give your dog some room to move and get some exercise. Plus it will help for those dogs that don’t like to go to the bathroom with someone standing right there. Zip ties are a must have item. I used these to make sure my bird travel cages were escape proof. They are great to have along for those just in case times, like when a crate looses a screw or you want to attach a bowl to a cage. Keep your pets shots current and keep their records together. The Red Cross shelters in our areas were accepting pets as long as they were crated or leashed, but they did say they had to be current on their vaccines. I’m not sure what would happen if your pet wasn’t current, but an emergency is not the time to find out. Along with keeping them up to date on vaccines, keep their records in a place where they are easy to grab. Everyone was happy to get home, to their normal cages, their normal schedule and their normal yard. Except for the diva bunny, Ms. Glee who decided she needed to grunt about everything I did for the next few days, no one seemed to have any problems getting into their routine. It was stressful and chaotic , but I was glad everyone was okay and we had a house to return to. We owe it to our pets to keep them safe. 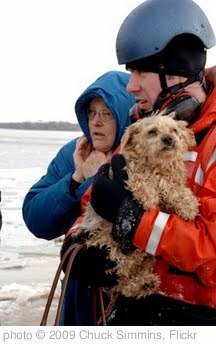 Are you prepared to go through a disaster with your pets? Have you ever had to evacuate with them? Please share any helpful hints and tips that can make it easier for someone else. This is a great list. I need to be more proactive on my emergency planning. We live on the BC coast, where they have been telling us a major Earthquake is “imminent” my entire life. Thanks for the tips, I hope I never need them, but if I do, they’ll be handy.